Compact new gravity-fed portable emergency eyewash stations have been released by Enware that provide a full 15 minutes of flow to help prevent permanent injury resulting from exposure to hazardous substances. The 34-litre HAWS7501 eyewash joins an extensive range of Enware deluge equipment certified to meet the ANSI Z 358.1-2004 standard for industrial and commercial use, where workers may be exposed to particularly hazardous chemicals and other injurious substances. 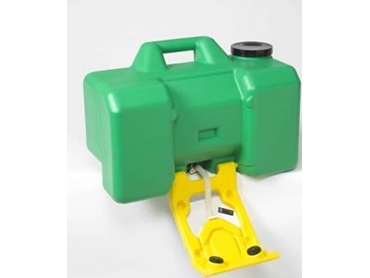 The highly visible eyewash station is made from durable FDA green high density polyethylene with a yellow fold-down arm for easy identification. Folding down the arm activates water flow and leaves hands free to hold open eyelids for a more effective flush. Folding it up protects spray outlets from dust, grime and damage encountered in indoor and outdoor use. A wide filler opening with threaded cap permits easy inspection, cleaning and filling. Using the HAWS9082 bacteriostatic preservative allows storage of water for up to six months. According to Enware, experts agree the important first aid for accidents involving eye or skin contact with injurious materials is copious irrigation within seconds. The recommended maximum time between accident and irrigation is 10 seconds, so emergency eyewash and/or shower equipment must be handily located, which is one of the features of this equipment, which is highly portable and comes with a wall mounting bracket. Placing eyewash equipment near workplace hazard locations can be critical because, when a hazardous substance makes contact with the human eye, damage to sensitive tissue can be immediate. In certain cases, the only hope to reduce the severity of injury and reduce the time and treatment required for recovery is by utilising emergency eyewash and shower facilities. With the wide variety of strong acid, caustic, paints, poisons, petrochemical and hazardous solutions in use throughout industry, it is a important risk management design consideration to ensure that the emergency eyewash and shower equipment is both compliant with the relevant Standards and installed in accordance with those Standards. 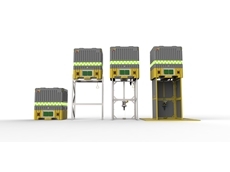 Enware’s portable and wall and pedestal-mounted safety equipment is part of an extensive range of Enware shower and decontamination technology manufactured in Australia to comply with the tough regulations covering workplace safety. 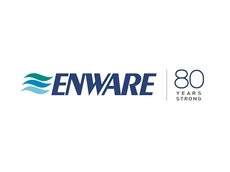 In what is believed to be a first in Australia, Enware has obtained third party endorsement for its safety deluge range in line with ANSI Z 358.1 2004 requirements. This means is that all relevant Enware products have been independently tested and approved by a registered independent body (the CSIRO). Enware’s emergency eyewash and shower equipment complements a broader range of Enware industrial safety equipment, spill prevention and containment products, spill pallets, workstations, salvage drums, overpacks and drum dispensing products.